I’m old enough to remember what life was like before easy access to the Internet, and especially before social media. Since platforms like Facebook and Twitter have exploded, I’ve had the opportunity to connect with people I’d never have even heard of before. One of those people is today’s guest, Liz Atkin. I ran across her on Twitter and was instantly intrigued. When Liz’s hands are idle, she’ll compulsively pick at her skin, which is a problem. 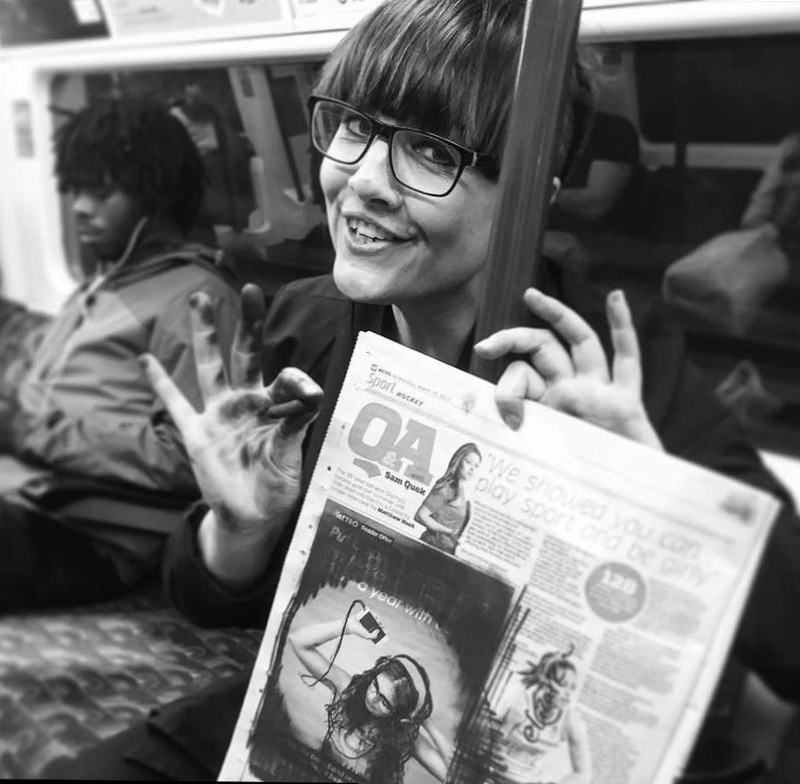 But she eventually came up with a brilliant solution: Occupy her hands by creating charcoal drawings on any newspaper that’s lying around on her commute (usually on the London Underground). Read on for more about this creative advocate from across the pond! You struggled with compulsive skin picking for more than 20 years. Can you tell us more about compulsive skin picking? Compulsive skin picking (CSP), also known as dermatillomania or excoriation, is a complex physical and mental disorder. Picking at skin is a very normal human behavior, but CSP is categorized by the repetitive picking at skin to the extent that significant damage is caused, and it impacts on a person’s daily functioning. It’s not known why humans develop this disorder. For some, environmental factors influence the development of skin picking or hair pulling disorders; others have hereditary links where family members may pick. CSP may start by picking at an existing blemish, or even at healthy skin, in an attempt to smooth it out or make it feel more “normal,” but the picking leads to scabs, infections, and eventually scarring, which causes a vicious cycle where the behavior loops. They are part of a family of disorders know as body-focused repetitive behaviors, which includes trichotillomania, the hair pulling disorder. There is currently no cure, but a lot of important research into skin picking and hair pulling disorders is currently happening in the U.S. In the Diagnostic and Statistical Manual of Mental Disorders, Fifth Edition, the diagnostic criteria includes “recurrent skin picking that results in skin lesions, repeated attempts to stop the behavior, the symptoms cause clinically significant distress or impairment, the symptoms not being caused by a substance or medical, or dermatological condition and the symptoms not being better explained by another psychiatric disorder.” Medication helps many, and cognitive-behavioral therapy (CBT) or habit reversal therapy are also valuable treatment options if you’re suffering. Did you know you had a disorder, or did you think it was a bad habit you couldn’t overcome? When did you realize what was actually going on? I suffered in silence for a very long time, probably 20 years or more, hiding the behavior every day. I had no idea it was a disorder. I was 29 when I first had the courage to Google it. I would experience an urge to pick, but sometimes it was very unconscious. This could affect different parts of my body: I’d pick my face, my hands, my back and shoulders, my arms, my feet. Many people think it would hurt, but actually it’s the opposite. It’s not about harming the body intentionally; those of us with skin picking are trying to perfect the skin by picking off a blemish. That urge to pick could be overwhelming, and although the damage could be very severe with my skin raw and bleeding, the gratification to pick could cause me to carry out the behavior over and over again. Sometimes I’d zone out and lose hours picking in front of the mirror. “Zoning out” could actually feel soothing, but the after-effects were extremely hard to cope with—not just the marks, wounds, and scars, but the guilt and shame of the disorder dominated my life. It also developed into something I did subconsciously; some nights I would pick until the early hours of the morning. I would even pick in my sleep. I masked and covered the illness from those closest to me, wearing clothes that concealed the parts of my body covered in scabs and scars, and using make-up to mask it on my face. The guilt, shame, embarrassment, and anxiety was terrible. Eventually I had no choice really but to try and help myself because it was destroying me. So what do you do with a disorder that is both a conscious urge and an unconscious behavior? That’s where my journey with art began. I had always had a fascination for the body and performance, so I studied theater. This led me to complete a BA in drama, and then a master’s in dance. During the MA in dance, I began exploring and studying my disorder. I’d never had therapy at that point, so a class exercise looking at everyday movement patterns as choreography led me to look at the body-focused repetitive behavior of my skin picking. Over the course of two years I slowly began to make photographic artworks directly about how it felt to live with this disorder. I’ve been working with textural materials like latex, clay, and acrylic paint to transform the skin over the last 10 years. It has helped me recover and learn to come to terms with the illness. More recently, drawing has become one of the best ways of all to channel the disorder and transform it. You’ve largely overcome your compulsive skin picking. One rather amazing technique that has worked for you is what you call compulsive charcoal—you make charcoal drawings to occupy your hands. Tell us more! How did it come about? I had CBT therapy during an episode of severe depression and chronic anxiety in 2014 with nearly a year off work. My skin picking had returned very badly. It was during this time my #CompulsiveCharcoal began by accident. A friend gave me a box of charcoal sticks as a present, and to stave off panic attacks and keep me focused during long commutes on the London Underground, I started drawing in sketchbooks. I noticed how relaxed and focused it helped me be. It was during one of those trips I ran out of pages, so I picked up and graffitied a discarded copy of the Metro free newspaper that was on a seat beside me. I posted a photo of the drawing on Instagram, and it generated a lot of positive reactions. It’s a kind of graffiti recycling, drawing onto adverts or images in the newspapers and upcycling them. Now, it’s a thing I do on newspapers, wherever I am in the world. I draw on planes, trains, and buses. This isn’t just some kind of art project for the sake of it. Whenever I am sedentary, skin picking is something my hands will do automatically, so to stop that from happening, I draw. This has has taken me on adventures to the other side of the world, to the M1 Singapore Fringe Festival. My two-week trip in January 2017 was sponsored by British Council, and I created more than 300 free #CompulsiveCharcoal drawings, and gave a series of public talks on skin picking and art at National University of Singapore, Lasalle College of the Arts, and Khoo Teck Puat Hospital. A film about my trip by Channel News Asia was viewed by 150,000 in the first 24 hours. 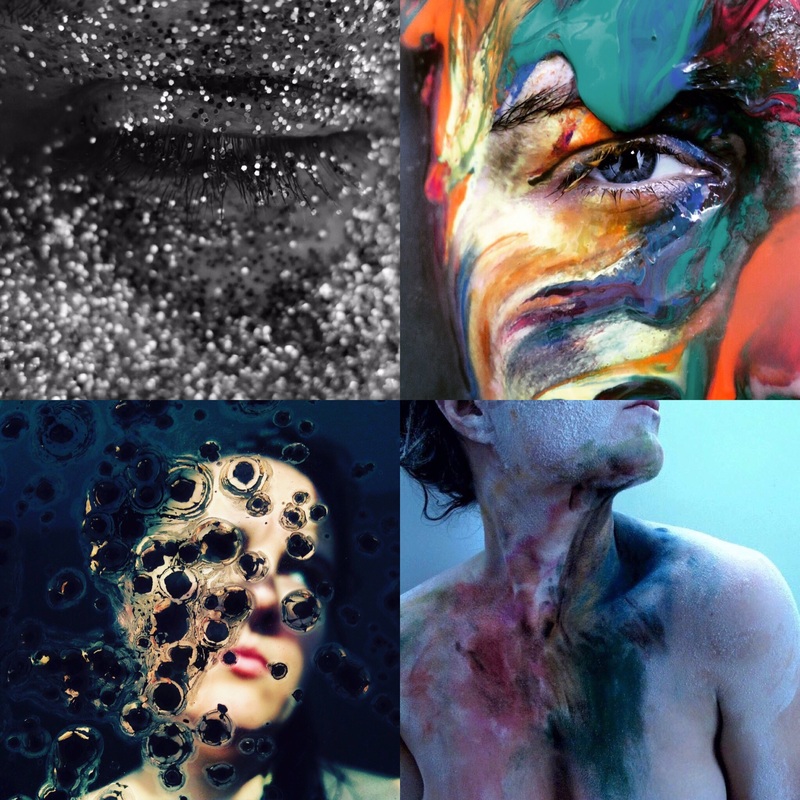 You’ve combined your artistic talent with spreading awareness of body-focused repetitive behaviors (BFRBs), but your advocacy isn’t limited to your artwork. What else have you done to draw more attention to these often misunderstood disorders? Much of this has been a happy accident. I didn’t train as an artist; I certainly had no idea how transformative art was going to be in my life. Much of it has evolved organically through the act of doing it. Because of the transformative experiences I have had with art, it is now a fully connected part of my life. I teach art and drama to all ages. I work in hospitals, hospices, prisons, universities, and schools, approaching creativity as a hugely important tool to help others. Art is my greatest tool for recovery. I had no idea what an incredible tool drawing would be to stop the CSP, but it’s become the greatest solution. Someone told me recently the drawings I create even look very itchy, which seemed like a very appropriate way to describe them! They are very quick. Each one takes just one minute; the speed and energy of the mark-making is absolutely akin to the skin picking. It helps me refocus my hands and fingers, be really present in the moment, and transform the urge of skin picking into a different repetitive action. Since I don’t really need the drawings (I just need to do them), I began handing them to curious passengers on the London Underground who’d caught my eye and obviously wondered why I was furiously drawing at that speed in the middle of a packed carriage. Acts of kindness and advocacy wherever I am. I now speak out for mental illness, educating others and reducing stigma. Whenever I am asked, I try to say yes! That includes public talks, specialist commissions, residencies, and exhibitions. 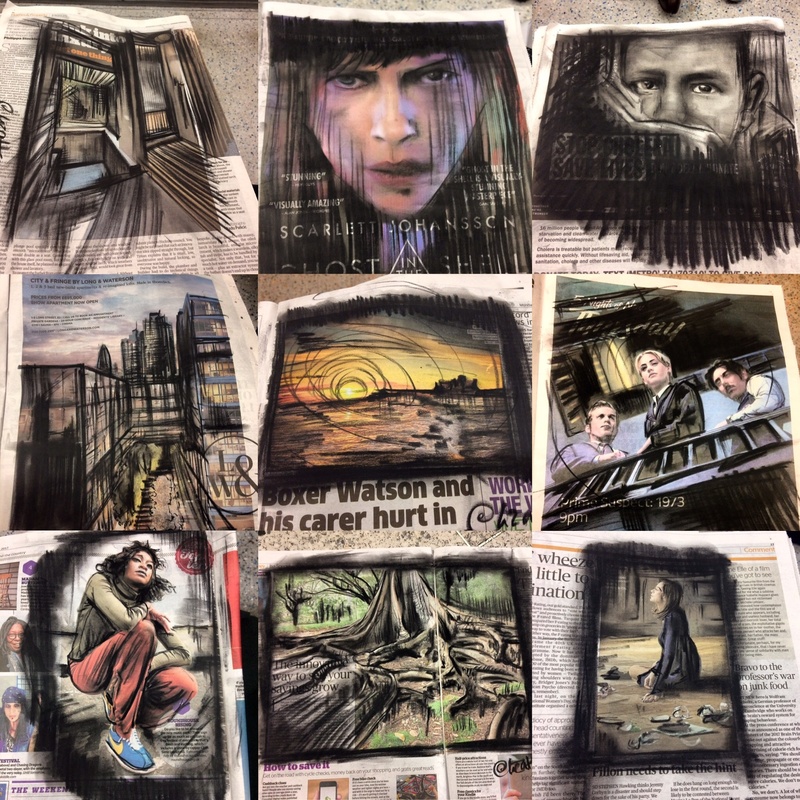 My story and art have been profiled in interviews for BBC Breakfast, BBC World Service Outlook, BBC Radio 4 Woman’s Hour, BBC Radio London, London Live, Al Jazeera TV, and BBC Arabic. Other media interviews include Huffington Post, Mashable, Metro, i Newspaper, The Mighty, The Daily Bruin Los Angeles, The Londonist, Bloomberg Business China, VICE Magazine UK, Diva Magazine, and Like-Minded Magazine, Amsterdam. In 2016 I was announced as a World Health Innovation Ambassador. I was the keynote speaker at the 2016 Global Conference in USA for TLC Foundation for Skin Picking and Hair Pulling Disorders. My international advocacy includes a week in California in October 2015 speaking to junior doctors at Keck School of Medicine at University of Southern California, University of California: Santa Barbara, and to Skin Picking patients at The OCD Center of Los Angeles. 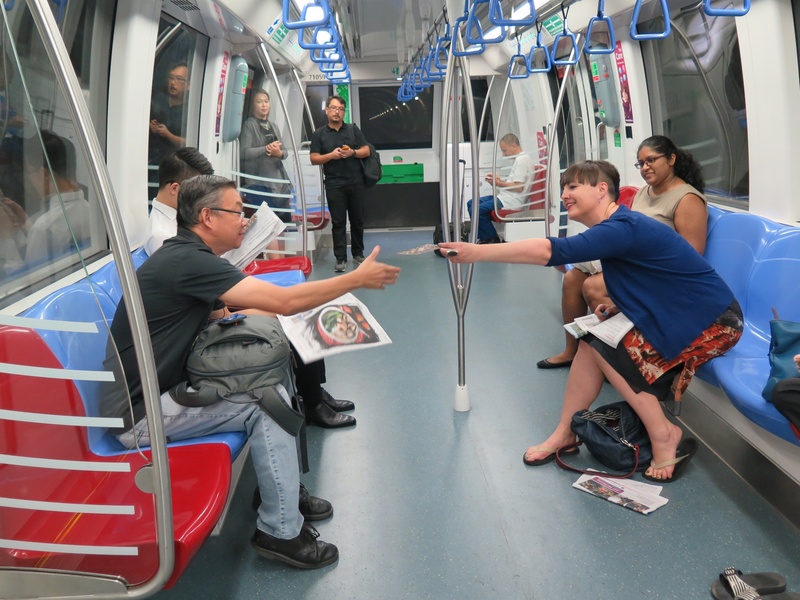 In 2017 I took part in the M1 Singapore Fringe Festival: Art & Skin sponsored by British Council, delivering a series of lectures and art workshops at hospitals and universities, and creating more than 400 of my free #CompulsiveCharcoal drawings on public transport. 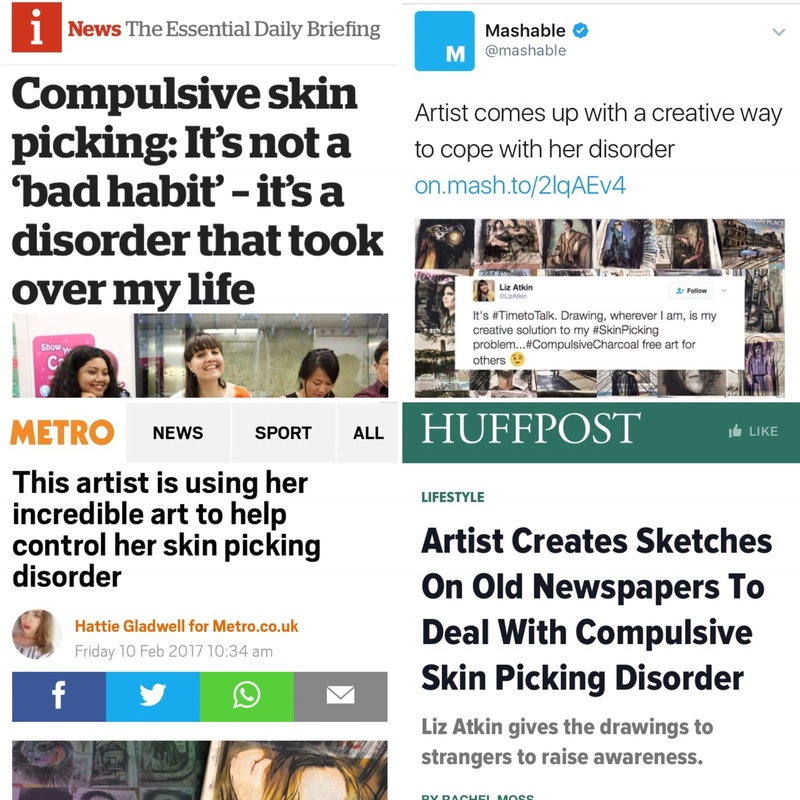 In the UK I have spoken on compulsive skin picking, art, and mental health for two TEDx events, Wellcome Collection, Critical Voices, Depression Alliance, Bethlem Gallery, Dragon Café/Mental Fight Club, Royal Society of Public Health, and Changing Minds at Southbank Centre. I was a speaker at the Global Conference for the Body Dysmorphia Foundation 2016 and Diversity Health Conference at University of Central Lancaster. Do you have advice for someone who’d like to get into advocacy but isn’t sure how? For a long time I didn’t feel able to say my artwork was about skin picking. That all changed for me in 2013 when I was offered an exhibition at Bethlem Gallery at Bethlem Royal Hospital in the UK, which is one of the oldest psychiatric hospitals in the world. It was a moment where I felt able to tell the truth, and I found it very liberating. I have met many others who have also started to share their lived experience and I think it can really help people to connect with others and contribute to shifting change in how mental illness is perceived. I realized that one encounter, one moment of identification with someone, whether that’s in real life or on social media like Twitter or Facebook, could cause a powerful ripple effect. It might prompt someone to seek help, get treatment, and start their own recovery journey. It also connects our experiences; I no longer feel alone in this disorder. I now speak out about this skin picking every day. It’s been a way to take back control of my life, but also I’ve found strength in being an advocate for well-being and mental health; it’s a way to share hope and recovery. Many people chat to me on the tube; little conversations about mental health happen with strangers about my graffiti drawings. I do up to 60 a day; in two years, I’ve given away up to 16,000 free drawings. That’s 16,000 mental health conversations and from that many thousands of people who may live with, or know someone who lives with, mental illness, or potentially CSP. Every drawing was a moment of connection, of advocacy for mental health, and a chance to let others know I am drawing because of CSP and I now carry free postcards to explain the disorder. What do you consider the most common misconception people have about skin picking? Many people think it’s just a bad habit, or something they ought to be able to just stop doing. The reality is many of us are hardwired with this genetically. Knowing that has helped with self-acceptance; it has helped me come to terms with it a lot. It’s not my fault, and not something I can just switch off or stop doing; skin picking movement patterns have been part of me for more than 30 years, so for me it has been about finding a way to change that, to rethink it, look after myself. Finding art, a personalized recovery tool, has been invaluable. It probably saved my life when I was at my lowest point with severe depression and chronic anxiety. Many others think it’s a form of self-harm, which is a real misconception. These are disorders in their own right, with very different characteristics, and the intention often starts with wanting to smooth or perfect the skin, not to cause a wound. It’s also worth saying 1 in 25 are thought to suffer from a BFRB—these are common, not strange, but many dismiss them as just a bad habit. If you could share just one piece of advice with others who struggle with compulsive skin picking, what would it be? Find your personal pattern—when do you pick, where, and how. For me bathroom routines and mirrors were tricky. So setting a timer to limit how long I’d be in the bathroom was useful. I knew it happened when sedentary or bored; I’d pick my fingers traveling on the train, and I’ve learned that keeping my skin moisturized does help me not scan for scabs or irregularities to pick at. And as it would happen when stressed or anxious, I feel I found a soothing activity—for me it’s drawing, which can occupy my hands, calm my mind, and engage my imagination. These have been hugely helpful. Finding activities with repetition seem to really work for me; the disorder functions through touch, gaze, and movement, so finding other activities to engage hands and motion are useful!